Craig Murray – undated letter removed reference to bribe. DOCUMENTS obtained by the media have revealed two legal regulators acted on significantly different versions of a letter bearing the name of an Advocate who also works as a Prosecutor for the Crown Office & Procurator Fiscal Service (COPFS). Listed in the Legal 500 Advocate Craig Murray of Compass Chambers- states on his website he represents clients in civil claims. Murray also states he works as an ad hoc Advocate Depute, prosecuting criminal trials for the Crown Office in the High Court of Justiciary. 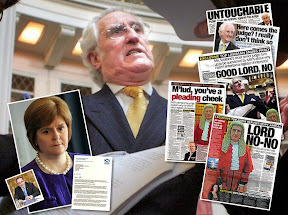 However, an ongoing media investigation has established Advocate Craig Murray is the author of a letter to the Scottish Legal Complaints Commission (SLCC) – a letter of which two distinct versions now exist and were considered separately by legal regulators. The investigation focuses on Murray’s role as Junior Counsel in Nolan v Advance Construction Ltd, and the conduct of legal figures in the case – spanning eight Court of Session judges - one a member of the privy Council, several Sheriffs, high profile QCs and Levy & Mcrae – the law firm identified in the £400million collapse of a Gibraltar based hedge fund - Heather Capital. The letter was sent by Mr Murray to the Scottish Legal Complaints Commission in relation to a complaint against senior QC, John Campbell – who claims to specialise in Planning law. Crucially, however, a significantly altered version of the letter - still bearing the name of Advocate Craig Murray as the author – removes references to ‘offers of a bribe’ to elected councillors at a Scottish local authority, and detailed references to evidence in a high value civil damages claim in the Court of Session. 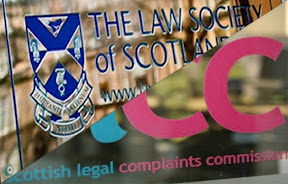 Enquiries have now established the version of Murray’s letter to the Scottish Legal Complaints Commission, on the subject of found its way to the Faculty of Advocates via the law firm Clyde & Co (formerly, Simpson & Marwick) – who are known to represent members of the legal profession who are subject to complaints, allegations of dishonesty, corruption and negligence claims. The complaint against John Campbell QC arises from his provision of legal services and representation to former National Hunt jockey & trainer Donal Nolan, who was the pursuer in - Nolan v Advance Construction Ltd – a case which is now likely to be heading to the UK Supreme Court for an appeal. 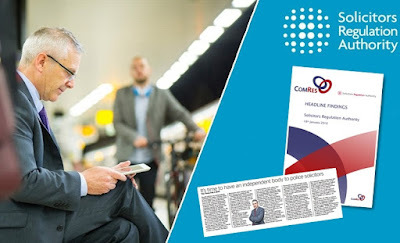 Questions have now arisen regarding extensive differences between the two versions of the letter, addressed to the Scottish Legal Complaints Commission. Both versions of the same letter bear Craig Murray’s name as author. Significantly, certain references to allegations of bribery involving employees of a construction company and elected councillors, have been altered in a second version of Mr Murray’s letter - which bears no date. However, the second version of the letter, has the references to bribery removed from the end of the sentence. Councillor John Taggart - who is referred to by Murray, was interviewed late last week. Councillor Taggart’s role in discovering the dumping of contaminated waste by Advance Construction Ltd, and his further efforts to assist Mr Nolan, and constituents affected by events, was crucial in bringing the case to court and into the public eye. In discussions with a journalist, Councillor Taggart made clear in his own view, the evidence in relation to the offer of an inducement related to an event occurred at the opening of Calderbridge Primary School (former site of Coltness Primary School), and NOT in a telephone conversation as Mr Murray claimed in his letter to the SLCC. Further, Councillor Taggart indicated the “person, whose identity was unknown to Mr Taggart” – according to Craig Murray’s statement, had in fact handed his business card to the Councillor during the school opening event. The Councillor further alluded to the identity of the person as an employee of a main contractor for North Lanarkshire Council. It has since been established both Advocate Craig Murray, and Fiona Moore of Drummond Miller were present with the Councillor when his precognition of evidence was taken. Further enquiries by journalists have now revealed the person who allegedly offered the inducement is an employee of a major construction contractor on North Lanarkshire Council’s list of approved contractors. When it became known the incident involving the inducement was to be used in evidence, the person who approached the councillor left Scotland for Ireland and did not return for a number of months – despite being cited as a witness to attend court to give evidence in the Nolan v Advance Construction Ltd case. The record later shows – John Campbell QC - failed to call the witness even though the individual alleged to have offered the inducement to the councillor appears on the final witness list for the proof hearing before Lord Woolman in 2014.. 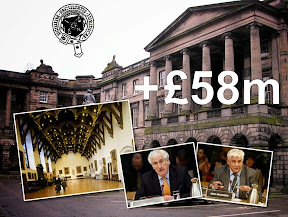 If the evidence of bribery had emerged during lines of questioning at the Court of Session, the testimony may well have had a significant impact on the case, and most probably initiated a Police Scotland investigation into the companies involved, and North Lanarkshire Council. However, Senior Counsel for Mr Nolan - John Campbell QC - chose not to introduce the conversation about the allegations of bribery in court. Undated & altered version of Advocate Craig Murray’s letter to SLCC. The removal of references to a bribe, and swathes of material removed from the second, ‘undated’ version of Craig Murray’s letter to the SLCC - raises further questions over the written testimony offered by the Advocate & some time Prosecutor to the Scottish Legal Complaints Commission. Curiously, the undated version of Murray’s letter then surfaces at the Faculty of Advocates – who chose to rely on this heavily altered version of Murray’s original letter - in relation to an investigation which ultimately dismissed the complaint against John Campbell QC. In a letter dated 7 October 2015 from the Faculty of Advocates to Melanie Collins, Iain WF Fergusson QC confirmed the Faculty of Advocates preferred the lesser content of the undated letter to be used in the complaint against the QC. In a letter of 2 May 2016 to the Scottish Legal Complaints Commission, law firm Clyde & Co - acting as legal agent for John Campbell QC against the complaint attempted to explain the discrepancy between the two versions of Craig Murray’s letter and how the undated version ended up at the Faculty of Advocates. However, the lengthy and laboured explanation from Clyde & Co to the Scottish Legal Complaints Commission, and the email from Iain Fergusson QC are completely at odds with a written explanation provided by Advocate Craig Murray to Mr Nolan’s partner, Ms Collins. It is unusual for such material to be made public as papers submitted to the SLCC remain unreleased due to confidentiality rules. However, the papers have been made available to journalists who are investigating the litigation process of Nolan v Advance Construction Ltd - after the case was brought to the attention of MSPs at the Scottish Parliament. 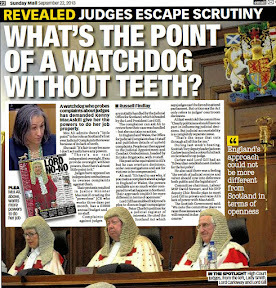 And, given the author of the letter - Craig Murray also works as an ad hoc Advocate Depute prosecutor in Scotland’s courts, there are now concerns over the implications of a Prosecutor being identified in various versions of the same letter, one version of which contains alterations to witness testimony in relation to criminal acts, and references to evidence in what has now become a key case of judicial failures to recuse, and accusations of bias in the courts. Late last week, the Crown Office was asked for comment on the matter and the impact on Murray’s role as a prosecutor. Initially, the Crown Office refused to comment, and demanded any request for media reaction be put in the form of a Freedom of Information request. However, there are clearly public interest questions in relation to a prosecutor named as the author of a letter where one version, used by a law firm with direct connections to the judiciary - removed evidence in relation to criminal acts and bribery. The Crown Office was then asked if the Lord Advocate intends to act to protect public confidence in the Crown Office and Procurator Fiscal Service by ordering an investigation into the use of altered versions of Mr Murray’s letter to the SLCC, and act on the status of Mr Murray as an Advocate Depute. 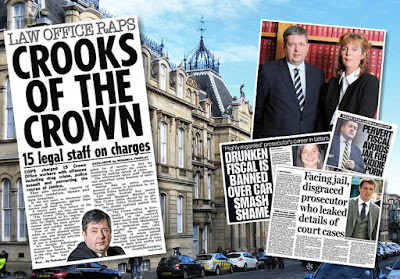 However, it has since been established, the Dean of the Faculty of Advocates during the sequence of events which saw the Faculty investigation into John Campbell – is the current Lord Advocate James Wolffe QC. As part of his current role as Lord Advocate - James Wolffe QC now oversees cases Craig Murray prosecutes while acting as an ad hoc Advocate Depute. 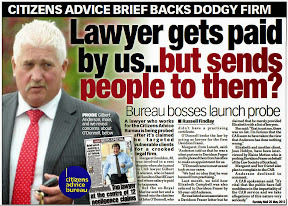 Additionally “The National” newspaper carried an exclusive investigation into the Nolan V Advance Construction Ltd case, here: Couple's human rights breach claim raises questions about how judicial conflicts of interest are policed. 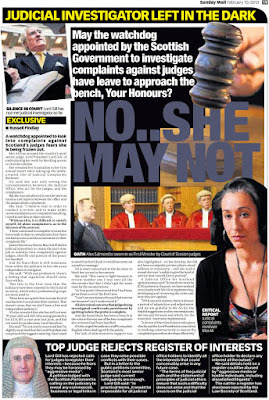 The newspaper’s investigation revealed there are moves to take an appeal to the UK Supreme Court at a date to be decided. 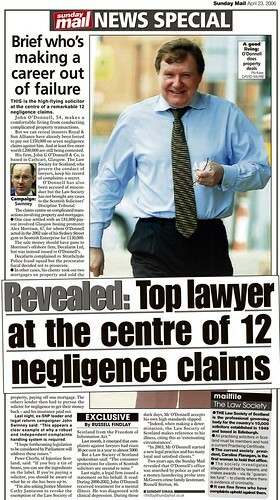 Papers now under consideration by journalists for upcoming publication, are set to reveal allegations a legal team – of which Mr Murray was a member - received disbursements from a senior QC from funds the QC obtained after demanding and personally collecting substantial cash sums of thousands of pounds from clients. The payments - outwith the normal procedure of paying advocate’s fees via a solicitor and to faculty services - are under investigation by journalists due to concerns in relation to irregularities and potential tax avoidance issues. 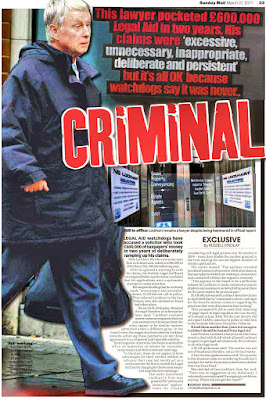 Craig Murray was contacted for his comments on material handed to the press. Craig Murray was asked why there were significant differences between two versions of his letter to the Scottish Legal Complaints Commission, one dated, the other undated. Craig Murray refused to comment. Craig Murray was asked to confirm if his letter was altered by someone other than himself. 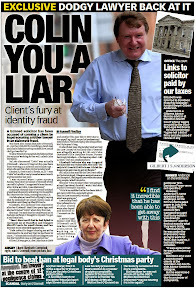 Craig Murray was asked if he was aware of Lord Malcolm's true identity (Colin Malcolm Campbell) and his relationship to solicitor Ewen Campbell, one of the legal agents working for the defenders. Lastly, Craig Murray was asked to comment on both versions of the letter he sent to the Scottish Legal Complaints Commission. He was asked which one he wrote and if he was aware anyone altered the second undated version of his letter. Craig Murray refused to give any comment. A billing document from Craig Murray’s Compass Chambers to the client, reveals he was to be paid £800 +VAT per day for proof preparation and £1,250 + VAT per day for Court, which ran to 8 days. A bill was subsequently received from Mr Murray’s stables for around £39,000. It has since been established, the SLCC relied on the dated version of Murray’s letter, while the Faculty of Advocates relied on the heavily altered undated version of Murray’s letter regarding their consideration of a complaint against John Campbell QC. 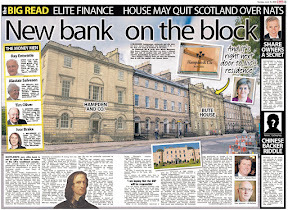 Papers obtained from case files and published in this investigation confirm the undated version of Craig Murray’s letter appears to have originated from the Edinburgh law firm – Clyde & Co (formerly Simpson & Marwick). The letter from Clyde & Co also confirms the undated version of Murray’s letter was sent to the Faculty of Advocates, on the instructions of Alistair Duncan QC. Duncan was tasked with defending John Campbell QC in relation to the complaint being considered the Scottish Legal Complaints Commission. However, Court papers record the same Alistair Duncan QC – who was now defending John Campbell QC, once appeared for the defenders against Mr Nolan - in the Nolan v Advance Construction case - on 9 November 2011. Late yesterday, the Scottish Legal Complaints Commission was provided with the two versions of Craig Murray’s letter, and a copy of a letter from Clyde & Co, admitting their role in providing the second, undated version with alterations to the Faculty of Advocates. 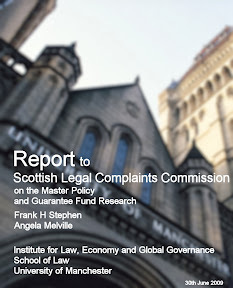 The Scottish Legal Complaints Commission was asked for a statement on the existence of the two versions of Craig Murray’s letter and what action the regulator intends to take. The SLCC refused to comment. However, the SLCC confirmed a meeting had taken place between their Chief Executive – Neil Stevenson – and former Cabinet Minister Alex Neil MSP - who has provided powerful backing for his constituent – Donal Nolan. 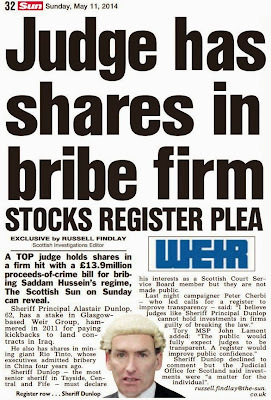 The case has now been brought to the attention of the Scottish Parliament’s Public Petitions Committee – who are probing judicial interests, failures of judges to recuse over conflicts of interest, and opposition of Scotland’s current Lord President – Lord Carloway – to calls for the creation of a register of judicial interests. Had a comprehensive and publicly available register of judicial interests existed at the time of the Nolan v Advance Construction Ltd case, details of judicial links in the register could have prevented injustice in the Nolan case – and many others in the courts - from the very outset. Qualifications: LLM in Commercial Law (Distinction),University of Edinburgh Member, Chartered Institute of Arbitrators Faculty Scholar, Faculty of Advocates LLM in Human Rights Law, University of Strathclyde, Dip Forensic Medical Sciences, Society of Apothecaries, Dip Legal Practice, University of Edinburgh LLB (Hons), University of Edinburgh. Craig has a busy defender personal injury practice in the Court of Session, representing insurers and local authorities. A substantial practice part of his practice is in defending fraudulent claims at all levels, in particular employers’ liability cases and road traffic claims.Craig also represents claimants in medical and dental negligence claims. Craig has been instructed in a number of complex product liability cases, including pharmaceutical cases (Vioxx and Celebrex) and medical products (mesh surgical implants and PIP silicone implants). Craig has substantial experience in property damage claims and other aspects of reparation.Craig occasionally acts in public law and human rights cases, including judicial review, mental health appeals and immigration.Craig has previously been a tutor on the Diploma in Regulatory Occupational Health & Safety at the University of Warwick and on the Civil Court Practice course at the University of Edinburgh. Craig was appointed as an Advocate Depute ad hoc in July 2015. He is a member of the Children’s Panel for the Scottish Borders. Among references to recent cases listed on Craig Murray’s profile is Nolan v. Advance Construction  CSOH 4, a land contamination case in the Commercial Court, with senior counsel. Lord President Lord Carloway made the offer in a detailed letter offering some concessions to MSPs - which has now been published by the Scottish Parliament. 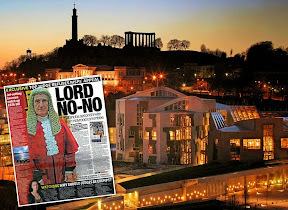 Lord Carloway (real name Colin Sutherland) also claimed in his letter to MSPs - that the subject of “online fraud” should also be considered as a reason to keep judges links to big business and significant wealth away from public gaze. However, MSPs have been reminded the subject of online fraud has proved no obstruction to the thousands of registers of interest already in operation across the public sector – from local councillors and workers on local government right up to the Prime Minister, politicians and even members of the security services. 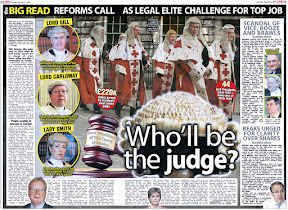 And, while Lord Carloway remains bitterly opposed to full judicial transparency – which would see the creation of a register of judicial interests to match all other branches of Government and those in public life including MSPs – the top judge has given a further concession to the petition in a decision to expand the current “recusals register” – where judges step aside from cases due to a conflict of interest. 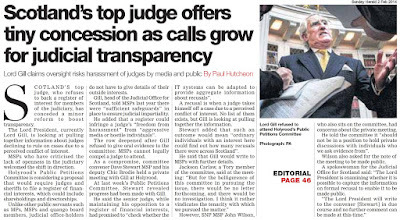 The concession from the Lord President comes after growing calls from those who support the judicial transparency proposals to give full information to the public on why judges are asked to recuse themselves in cases where conflicts of interest arise in court. 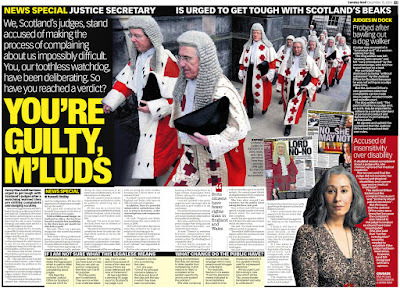 Since 2014 – when the then Lord President Lord Brian Gill created the register of recusals in an attempt to head off demands by MSPs and the public to bring in the register of interests for judges, there have been over 70 recusals from members of Scotland’s judiciary in cases throughout Scotland. The recusals have occurred on issues where conflicts of interest have arisen – such as membership of charities, relationships between judges and those appearing before them in court, and other ‘conflicts of interest’. 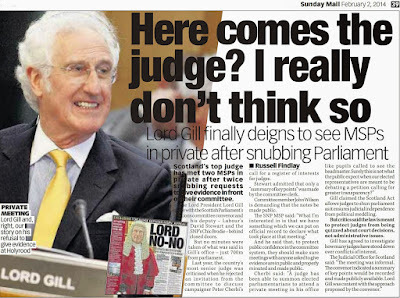 In one case during 2014, Lord President Lord Gill was forced to step aside from a court hearing after he realised his son – Advocate Brian Gill, represented one of the parties in a court action which the Judicial Office have refused to give any further detail on since the recusal took place in late June 2014. However, a recent investigation by the media has revealed judges are refusing to recuse themselves in high profile cases in the Court of Session – where inks to the judiciary permeate right across the court room. 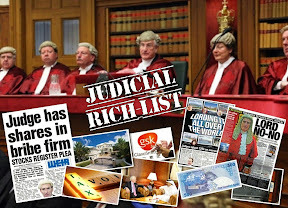 An investigation published by Diary of Injustice earlier this month revealed Court of Session judge Lord Malcolm heard a case eight times, where his own son Ewen Campbell had an interest as a representative and adviser to the defenders – construction company Advance Construction Ltd. 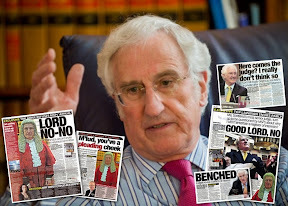 Investigations by journalists has revealed there is no written record of any recusal by Lord Malcolm (real name Colin Malcolm Campbell) - who only stood aside from considering the action well into the hearings after he ‘realised’ the involvement of his son in the case. 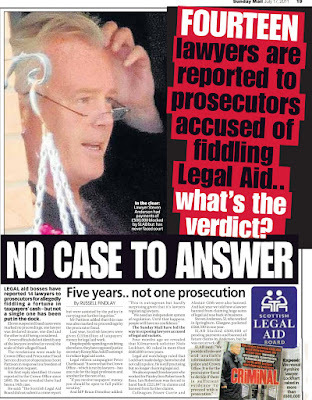 Lord Malcolm then handed the case over to Lord Woolman - who heard the proof in the case - which has now become the subject of increasing questions after material was handed to the media suggesting key parts of the evidence founded upon by Lord Woolman have no evidential basis. In an unprecedented move, Lord Malcolm then returned to the case for an eighth hearing to hand over money which had been lodged by a third party as caution for an appeal. 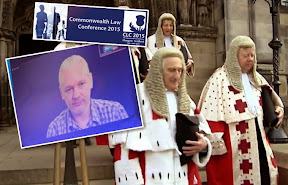 It is thought this is the first incidence of a judge returning to a case he previously stood aside from, yet there are no details contained in the current register of recusals, even though the pursuer lodged an appeal against Lord Malcolm’s reappearance in the damages claim. The move has been frowned upon by legal observers – many of whom agree a judge should not be allowed to sit on a case they have previously recused themselves from, and calls are now being made to the Lord President to establish such a rule in the code of Judicial ethics and conduct, ensuring similar events do not take place in the future. And, in relation to media enquiries seeking an explanation for Lord Malcolm’s decision to return to the case, the Judicial Office have refused to give any details on why Lord Malcolm refused to consider his position as a recusal matter. The high value civil damages claim – Donal Nolan v Advance Construction Ltd - initially heard in Hamilton Sheriff Court and then transferred to the Court of Session for a ‘speedy’ resolution – involved the dumping of 16,500 tons of contaminated waste by the defenders from a North Lanarkshire Council PPI project on the land of Donal Nolan - the well known & respected former National Hunt jockey & trainer. 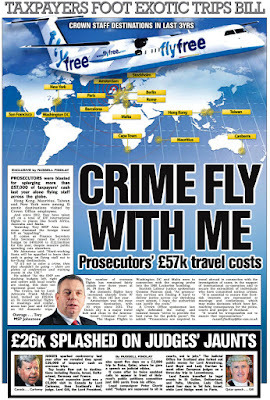 At the time, the defenders solicitor - Ewen Campbell - worked for Glasgow based Levy & Mcrae – a law firm linked to Scotland’s judiciary and more recently named in a writ in relation to the £400million collapse of a Gibraltar based hedge fund - Heather Capital. Papers now lodged at Holyrood reveal Ewen Campbell reported back to former Levy & Mcrae senior partner and suspended Sheriff Peter Watson on the day to day running of the case for Advance Construction Ltd. 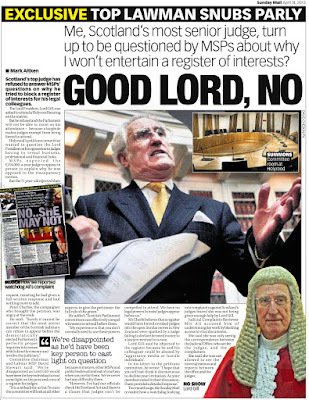 Details of the shocking case – which has seen no less than seven additional judges hear motions and interlocutors, has now been made to MSPs studying the plans to create the register of interests – which would also require members of the judiciary to disclose their links to others in the legal profession, links to business and other information. I refer to your letter of 23 January. I have taken some time to review the evidence provided to the Committee by Professor Alan Paterson and to reconsider the position. • First, whether there have been any inhibitions to the administration of justice arising in relation to those members of the judiciary who have to register financial or other interests in connection with other roles. "Consideration requires to be given to judges' -privacy and freedom from harassment by aggressive media or hostile individuals including dissatisfied litigants. It is possible that the information held on such a register could be abused." All senators and all sheriffs exercise a civil and criminal jurisdiction. I am concerned that, at a time when online fraud is becoming increasingly sophisticated, a dissatisfied litigant, or a convicted person, may choose to retaliate by these means. A register of judicial interests may provide a starting point for that. That has not, to the best of my knowledge, happened with the small cohort of judges who have disclosed financial interests through JABS or the SCTS Board, but that sample is so small that no comfort can be derived from that. Rather, I expect that judges will become increasingly vigilant about the risks of personal information appearing in the public domain. Accordingly, one possible inhibitory effect on the administration of justice is that judges may start to decline positions on important public bodies such as these if that requires the disclosure of financial interests. In the same way, a register of judicial interests may have a damaging effect on judicial recruitment. You may be aware that, partly because of major changes to pension arrangements, difficulties have arisen in the recruitment of the senior judiciary. Revealing personal financial information is likely to act as a further powerful disincentive. • Secondly, whether a decision on "recusal" should rest with a judge other than the individual who has been challenged or who has been identified as having a potential conflict of interests. I assume that the proposition here is that the decision on declinature of jurisdiction should be made by someone other than the judge hearing the case, presumably another judge, or judges. At present, if a judge is asked to decline jurisdiction, and does not do so, then that decision can be reviewed, on appeal, by the appellate court. Any other system would not be an improvement. Cases are often allocated to judges, both in the Court of Session and the sheriff courts, at short notice. A party or a judge may not be aware of the circumstances in which the issue of declinature must be considered until the morning of the case. If he then requires to pass that issue to another judge, for consideration, the case is likely to be adjourned for that purpose, to the disappointment of litigants and the inefficient disposal of business in the courts. The present system whereby a judge, having seen the papers and being aware of the precise extent of any interest financial or otherwise he may have, makes the decision on recusal, is the preferred option. Judges are invariably prudent in declining jurisdiction appropriately, but the right of appeal ensures that in, any rare case where that is not done, redress is available. I should add that, as a generality, the problem, if there is one at all, rests with an over cautious approach to declinature: ie with judges or sheriffs declining jurisdiction and thus prompting an adjournment and causing delay when they should, in accordance with their duty, have heard and determined the cases placed before them. • Thirdly, whether it would be in the interests of greater transparency for the "Register of Recusals" to be extended to cover instances where recusal has been considered or requested but jurisdiction has not been declined. I would have no difficulty with the proposition that the register of recusals could be extended to cover instances when a judge has recused himself, and when he has declined to do so. The additional burden, which will fall upon the clerks of court, should not be great, and I agree that this may provide additional transparency. I hope this is of assistance to the Committee. I indicated in previous correspondence that I felt I could add little more to the views previously expressed. That remains my view. However, if the Committee wishes me to provide this evidence orally, I will do so. Responding to the letter from Lord Carloway, the petitioner has lodged a reply with MSPs. 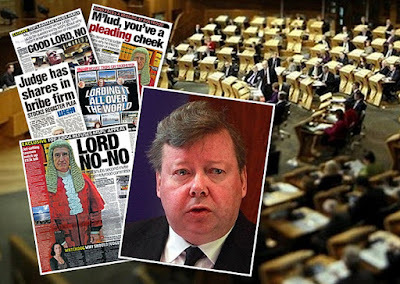 The petitioner endorsed Lord Carloway’s offer to give evidence before the Committee, answered Lord Carloway’s concerns in relation to online fraud. 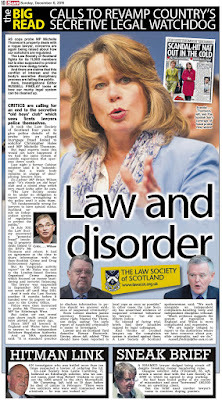 Moves by the Lord President to expand detail in the current recusals register were also welcomed by the petitioner, who suggested Lord Carloway add the same level of detail to the register of recusals which also appears in court opinions published on the Scottish Courts and Tribunals Service website. Noting Lord Carloway’s offer to give evidence in public session, I urge members to invite the Lord President to an evidence session so the Committee and public can hear from the current Lord President on this petition and evidence submitted to the Committee. Regarding Lord Carloway’s concerns about online fraud and the proposal to create a register of judicial interests, I would point out the subject of online fraud has not particularly affected or precluded other branches of public services and government, including the Scottish Parliament, from maintaining registers of interests which include financial and other details - for a considerable length of time. Online fraud is a matter which everyone in society must deal with. 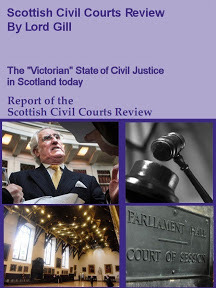 Information readily published by the courts, the Crown Office and other bodies within the justice system in relation to court opinions or verdicts, contain financial, location or other personally identifiable information of significantly greater detail than is currently published about any member of Scotland’s judiciary. 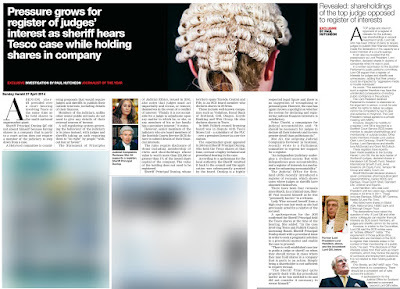 With regards to concerns in relation to judges declining positions on public bodies which require the disclosure of financial details, I wish to point out judges are wealthy, well connected and influential members of the most powerful group of people in society – the judiciary. The viewpoints they hold, their status, power, and their part in decision making goes on to form public policy or law, impacting on all areas of public life. Members of the judiciary who hold positions on public bodies, remunerated or not, should be required to declare their financial and other interests, like other members of those bodies, as there is a public expectation of transparency in all decision making and branches of Government. 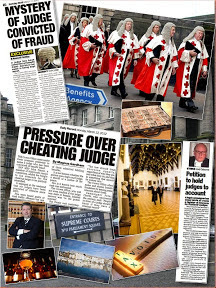 Noting Lord Carloway’s comments on the current system of judges deciding whether to recuse themselves or not, this system has been proved to hold significant failures, where cases have been heard by judges who refuse to recuse themselves or, have failed to declare an interest. The Committee has already been made aware of such cases where in one example an individual was denied their liberty, then an appeal judge who threw out the appeal, claimed in a newspaper investigation he forgot he prosecuted the same individual who was appealing his conviction. A new system of someone else deciding if a judge should recuse themselves, along with a full and open account of the recusal decision, should be created. I do not believe such a system would pose unwarranted financial expense or considerable delays to cases. Noting Lord Carloway’s acceptance of my previous suggestions to widen the scope of the recusals register, I support the inclusion of details where a judge is asked to recuse, considers recusing on his own, or refuses to recuse. Further, I suggest it would be no great effort to include case reference numbers, and parties in the publication of details in the recusals register (the subjects of cases permitting), in similar form as already regularly appears in court opinions on the Scottish Courts website. The routine publication of such detail and data should be standard practice of a transparent and accountable justice system so when a recusal request or decision occurs, court users, legal representatives ,the public and media know exactly why and for what reason a decision was taken. 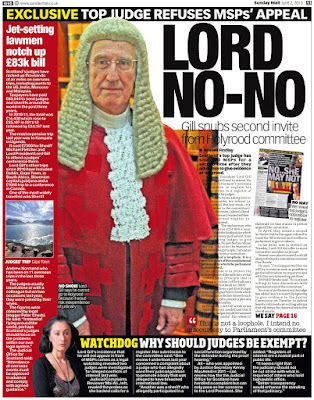 Judicial Interests probe - Lord Malcolm heard case involving his own son. 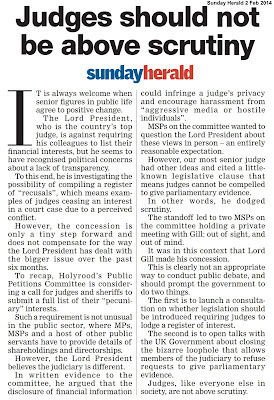 AN INVESTIGATION by MSPs into proposals to create a register of judges’ interests has received evidence which contradicts claims by top judges - that members of the judiciary recuse themselves when they have conflicts of interest in court. Papers lodged with the Scottish Parliament’s Public Petitions Committee in relation to Petition PE1458: Register of Interests for members of Scotland's judiciary - reveal Court of Session judge - Lord Malcolm – real name Colin Malcolm Campbell QC – took part in multiple hearings on a case which began with his son – Ewen Campbell - providing legal representation to building firm Advance Construction Ltd. However, Lord Malcolm did not recuse himself from any of the hearings, and no one in the court made the pursuers aware of any relationship between Lord Malcolm and Ewen Campbell until years into the court case. The high value civil damages claim, initially heard in Hamilton Sheriff Court and then transferred to the Court of Session for a ‘speedy’ resolution – involved the dumping of 16,500 tons of contaminated waste by the defenders from a North Lanarkshire Council PPI project on the land of Donal Nolan - the well known & respected former National Hunt jockey & trainer. Crucially, answers lodged by the defenders in relation to an appeal by the pursuer in 2016 – finally confirmed the relationship between the judge hearing the case and the defenders solicitor, admitting Ewen Campbell was Malcolm’s son, and had been acting for the defenders in court in earlier hearings. However, the admission of the relationship between the judge and the defenders solicitor came years into the case, and questions are now being asked as to why the judge, and no one else in court informed the pursuers of this potential conflict of interest at a much earlier stage in the action. 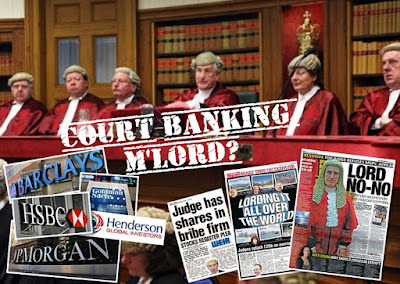 Pleadings to the court reveal Lord Malcolm heard the case on eight separate occasions, listed as 3 May 2012, 11 May 2012, 24 July 2012, 4 October 2012, 13 March 2013, 11 April 2013, 20 May 2013 and on 16 March 2016. However, there is no record of any recusal by Lord Malcolm in the case. During the 11 April 2013 hearing, a note of the decision written by clerk Kate Todd reveals Lord Malcolm appointed Lord Woolman to hear the proof. The move to appoint another judge is now subject to debate and questions from the pursuers and legal observers, given the fact Lord Malcolm had already taken part in no less than five hearings in Mr Nolan’s case without any recusal with regard to his son’s interest as legal agent for the defenders. According to normal procedure, the appointment of Lord Woolman to the proof should instead have been undertaken by the Office of the Keeper of the Rolls of the Court, and not by another judge. Lord Woolman has since come in for criticism after key parts of his 2014 opinion have been subject to concerns in relation to a lack of evidence and ‘unauthorised’ actions attributable to a senior QC. 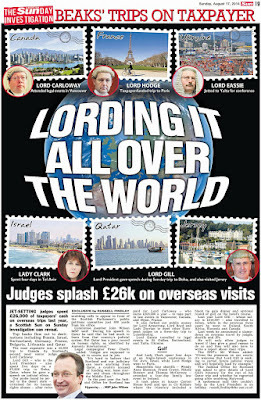 However the saga of Lord Malcolm’s appearances in the case did not end with the proof being handed over to Lord Woolman in 2013. Lord Malcolm returned to the same case during 2016 for another hearing - in order to hear and grant a motion handing money to the defenders - which had been lodged for an appeal by a friend of Mr Nolan. 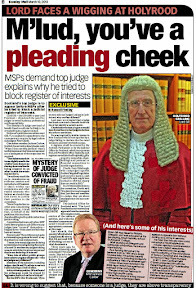 The return of a judge to a case in which MSPs have been told he should have stood aside due to a conflict of interest - has now prompted concerns over the integrity of information currently supplied by the Judicial Office since 2014 relating to judicial recusals - and previous claims by judicial figures to politicians that judges had recused themselves when required to do so prior to the creation of the recusals register in 2014. 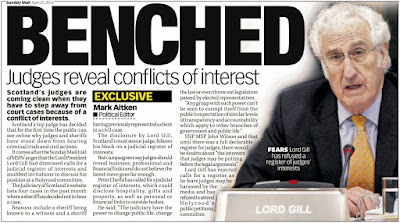 And, it has been pointed out - Lord Malcolm’s position on such an obvious conflict of interest contrasts starkly with action taken by former Lord President Brian Gill – who avoided the same situation when forced to step down from a case in June 2014 when Lord Gill’s son - Advocate Brian Gill – appeared in the same court acting for a party in a hearing. With increasing calls for transparency on judges’ declarations and interests, questions are also being asked why a judge was allowed to sit unchecked so many times on a case in which his own son provided legal representation for the defenders. 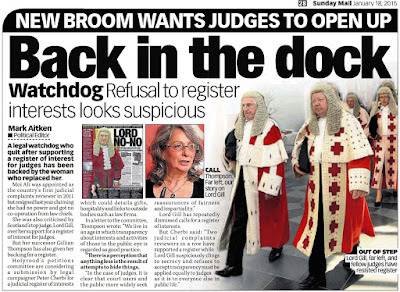 The case involving Lord Malcolm - has now been brought to the attention of members of the Scottish Parliament’s Public Petitions Committee – who are involved in a five year probe on the judiciary and proposals put forward to require judges to register their interests. 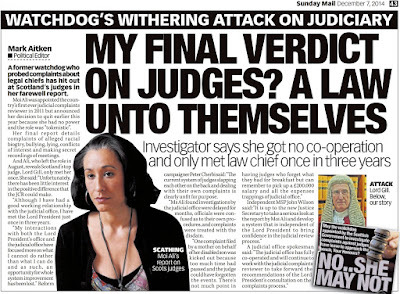 Writing in a submission to MSPs, Mr Nolan’s partner - Melanie Collins - said had a register of interests for judges existed in Scotland, the existence of such a register would have resulted in Lord Malcolm recusing himself from hearing the case. 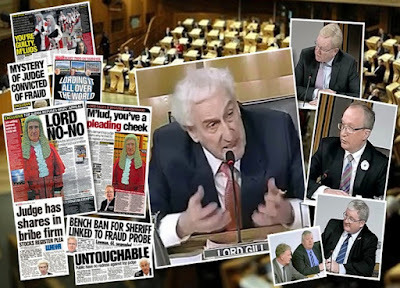 Ms Collins also highlighted links between the same judge – Lord Malcolm – and a ruling affecting hundreds of solicitors and members of the public which toppled over 700 investigations by the Scottish Legal Complaints Commission against solicitors and law firms accused of wrongdoing. Ms Collins informed MSPs the SLCC were at the time investigating a complaint in relation to issues surrounding Mr Nolan’s case. 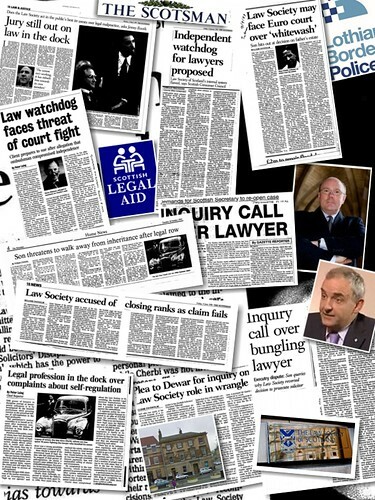 However, the ruling by Lord Malcolm ‘coincidentally’ closed down the legal regulator’s investigation into solicitors involved in the case, and hundreds of other cases after the judge struck down a 30 year policy where the Law Society of Scotland and SLCC investigated “hybrid complaints’ comprising of conduct and service issues against solicitors since before 1980. Now, Ms Collins and her partner Mr Nolan both have the support of their constituency MSP Alex Neil and backing to bring their experiences to the Scottish Parliament. I would like to make the following submission in relation to the current system of judicial recusals. 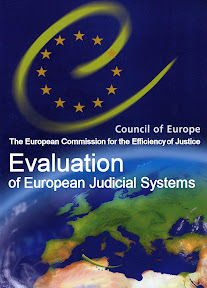 In my view the system is not transparent about the circumstances in which judges should recuse themselves, such as circumstances in which a judge could be perceived as having a potential bias, or the instances in which a judge may be asked to consider recusing themselves but decide not to do so. My experience demonstrates that the recusal register is not working and that a register of interests being put in place is both necessary and correct to allow the public to have faith in the judiciary and transparency of the judicial system. My views arise from a case raised on my partner's behalf and in which a senior judge did not recuse himself, in circumstances in which the existence of a register of interests may have resulted in him having done so. The matter, which I note has already been mentioned in a submission by the petitioner and has been aired by Committee members, has relevance to a recent ruling in the Court of Session a recent ruling in the Court of Session carried out by the Scottish Legal Complaints Commission . In a civil case raised in the Court of Session, on behalf of my partner, Mr Donal Nolan, Lord Malcolm (Colin Campbell QC) heard and ruled on evidence in the case. His son, Ewen Campbell, who at the time was with Levy & McRae, was an assistant solicitor involved in the day-to-day running of the case, providing the defenders with advice and representation in court. Ewen Campbell reported back to Peter Watson, formerly a senior partner of Levy & Mcrae, and (at the date of this submission) currently suspended as a temporary sheriff. In the case raised on behalf of my partner Mr Nolan, had a register of interests for members of the judiciary existed prior to the case coming to court, this may in my view have resulted in Lord Malcolm having recused himself. 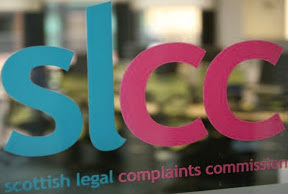 In relation to the impact of this on the ruling in the case involving the Scottish Legal Complaints Commission, the SLCC were investigating matters in relation to this case which the ruling by Lord Malcolm had the effect of changing the hybrid complaints process which resulted in numerous cases not being concluded. 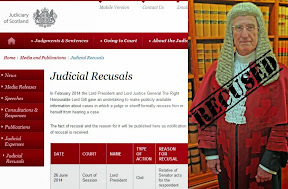 There are examples in the judicial recusals register of judges recusing themselves, particularly the instance where former Lord President, Lord Brian Gill, recused himself on 26 June 2014, after his son appeared in the same court acting for a respondent. It is not clear to me how this instance differed from my case where Lord Malcolm did not recuse himself and on which Lord Brodie’s opinion concluded that the circumstances did not satisfy the test for apparent bias or that there was a question of interest on the part of Lord Malcolm. This lack of clarity about when recusal is appropriate does not help in assuring public faith in the judiciary and transparency of the judicial system . Carloway, to make him aware of concerns in relation to my own experience before the Court of Session. 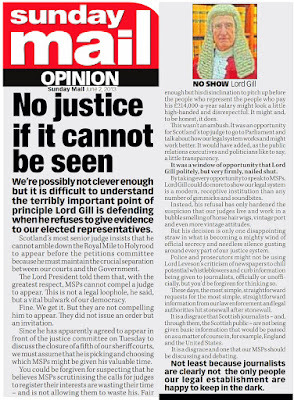 No action has been taken by Lord Carloway to address the matter, which in my view is of significant concern where there is a potential conflict of interest, and where the transparency of the judicial system could be improved. In a response from the Lord President’s Office, information about the complaints mechanism for judges was not provided. As members of the Committee have previously been made aware of certain details of this case, I would very much welcome the opportunity to give evidence in a public session, and also that my MSP, Alex Neil whose assistance has been invaluable in advancing matters, be invited to give evidence before the Committee. An ongoing investigation into a case in which a judge did not recuse himself from seven hearings on a case where his own son represented the defenders, and returned for a eighth hearing in 2016 to hand over sums lodged as cation for an appeal – is eroding confidence in Scotland’s top court - the Court of Session. Journalists examining papers relating to Lord Malcolm’s eighth appearance to the case of Nolan v Advance Construction Ltd - have revealed a motion lodged by pursuer Mr Nolan for permission to appeal the decision by Lord Malcolm to hand over the £5,000 lodged as caution for expenses was blocked by Lord Brodie – but only after the judge appeared to be talked out of considering the pleadings by the defender’s QC. The appeal raised by Mr Nolan against Lord Malcolm’s decision to hand over the cation - raised a conflict of interest and human rights, stating “grounds of justice and all persons who have an interest in the case should have been declared”. This appeal was lodged during 2016 - only after the pursuer had been alerted to the fact a solicitor – Ewen Campbell – who acted for the defenders was actually the son of the judge - Lord Malcolm – who had presided over the case on seven previous hearings. During hearings in relation to the initial lodging of the £5K cation by a friend of Mr Nolan – the QC, Roddy Dunlop acting for defenders Advance Construction Lrd asked Lord Menzies to increase the amount of the cation to around £35K. However, Lord Menzies denied the defenders their motion to increase, and thought £5K was sufficient for to advance the appeal. Then, in a later hearing, Lord Brodie said the money for the appeal should have been left in situ after the pursuer entered pleadings - requesting the cation be returned to the third party. However Balfour & Manson - acting on behalf of Levy & Mcrae - for Advance Construction Ltd – presented a motion requesting the money be handed over to the defenders. It was at this hearing, Lord Malcolm returned for the eighth occasion after earlier recusing himself from the case – to hand over the cash to the defenders. The pursuer - Mr Nolan – then sought a written opinion from Lord Malcolm for his decision on 16 March 2016 to hand over the cation – however none was forthcoming from the judge or his clerks. An opinion by Lord Brodie from the Court of Session – dated 20 May 2016 which the Scottish Courts Service has refused to publish – reveals Lord Brodie - who previously ruled on parts of the case, returned to hear Mr Nolan’s motion requesting for leave to appeal Lord Malcolm’s decision to the UK Supreme Court. In the difficult to obtain opinion, Lord Brodie appeared to be going for the pursuer’s pleadings in that the test was met for a fair minded observer to conclude a conflict of interest existed on the part of Lord Malcolm. However, as Lord Brodie’s opinion continues, the judge is then persuaded against granting the pursuer’s request for leave to appeal by the defender’s QC – Roddy Dunlop. 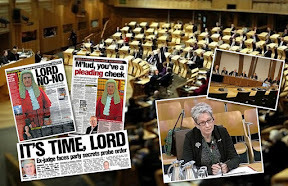 Commenting on the developments at the Scottish Parliament, the petitioner suggested the rules around judicial recusals should be improved to ensure a judge who has already recused themselves from a case should not be allowed to return to the same case at any later date. 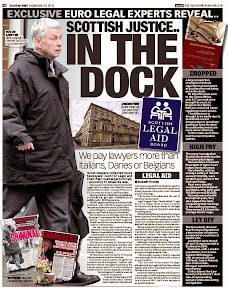 * a senior QC sent emails to the pursuer and his partner demanding cash payments outside of the process where Advocate’s fees are normally paid through solicitors to Faculty Services. 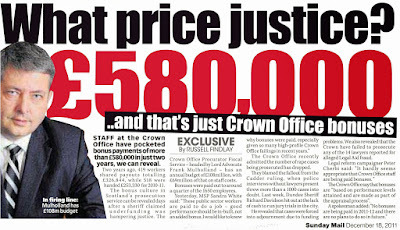 At the time of these demands for cash payments, the current Lord Advocate – James Wolffe QC – was the Dean of the Faculty of Advocates and fully aware of the QC’s irregular requests for cash. * a set of desperate emails from a senior QC demanding possession of a recorded consultation during which, among other issues the pursuer’s legal team seem aloof of developments in major contamination & planning related cases. 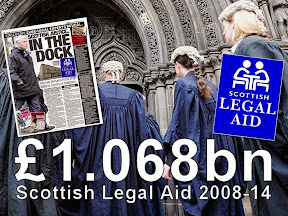 * Evidence of Advocates’ demands for cash payments and falsified documents handed to James Wolffe QC – the then Dean of the Faculty of Advocates and now Scotland's top prosecutor – the Lord Advocate – were not acted upon or properly investigated. * North Lanarkshire Council paid out £2 million pounds of public cash which ended up with the defenders after they were paid in a subcontract agreement – yet the contaminated material dumped by the defenders on Mr Nolan’s land is still there and no action has been taken to remove it while the Scottish Environmental Protection Agency (SEPA) ‘looked the other way’. * Mr Nolan had obtained a Soul & Conscience letter from his doctor due to ill health, lodged as document 148 of the process. The existence of the Soul and Conscience letter meant Mr Nolan should never have been put a position to address a court under the circumstances but was forced to do so. 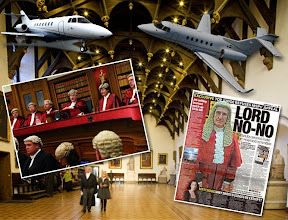 * the blocking of an appeal to the UK Supreme Court by Lord Hodge – who failed to declare he previously sat on the Nolan v Advance Construction Ltd case at least eighteen times while he served as a judge in the Court of Session.